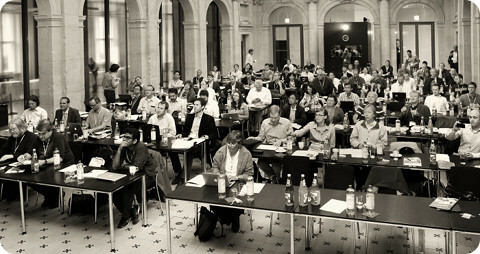 The Workshop on the Economics of Information Security (WEIS) is the leading forum for interdisciplinary scholarship on information security and privacy, combining expertise from the fields of economics, social science, business, law, policy, and computer science. Prior workshops have explored the role of incentives between attackers and defenders of information systems, identified market failures surrounding Internet security, quantified risks of personal data disclosure, and assessed investments in cyber-defense. The 2012 workshop will build on past efforts using empirical and analytic tools not only to understand threats, but also to strengthen security and privacy through novel evaluations of available solutions. Enter the conference venue from Markgrafenstrasse 38. If you have any questions, please contact info@weis2012.econinfosec.org and respond to the automatic verification message. Your message will be forwarded to the organizers. Ross Anderson liveblogged from WEIS 2012. The edited proceedings of WEIS 2012 are now available: The Economics of Information Security and Privacy, Rainer Böhme (Ed. ), Springer-Verlag, Berlin, 2013, 321 p.